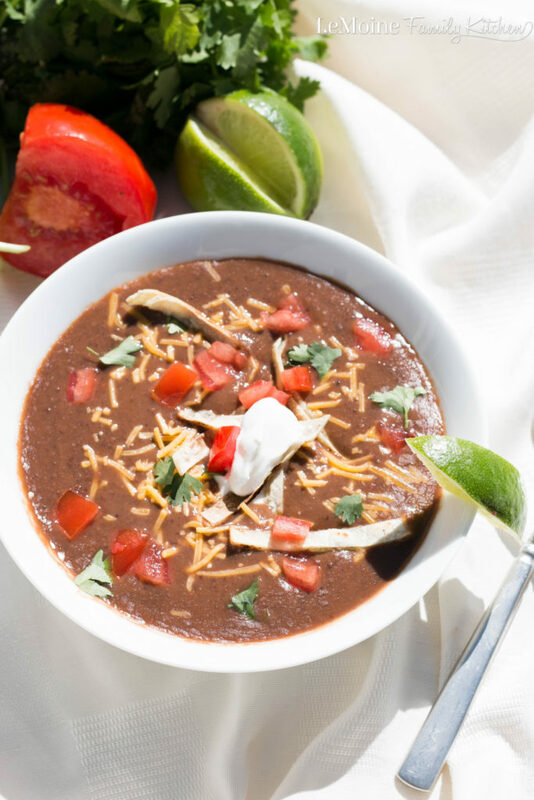 This Easy Black Bean Soup is hearty and healthy soup comes together so easily and is packed with flavor. A great weeknight dinner. I am a huge fan of soups, we already know that right? Truly though they are a great go to meal. 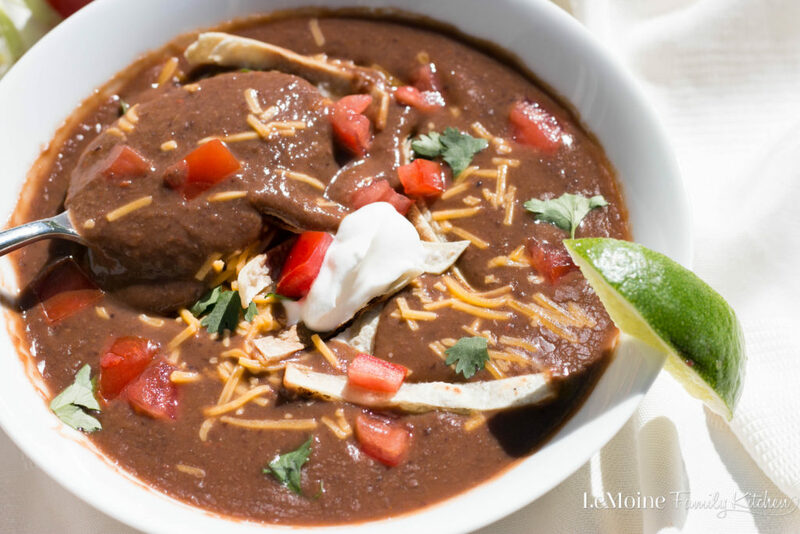 Typically they come together really easily and quickly and can be really healthy and hearty like this Easy Black Bean Soup. Full of fiber this one will keep you feeling full for hours. I also love this Easy Black Bean Soup because topping it is really fun and customizable to your likes. Ok ok so what goes into this gorgeous soup? Red onion, a red bell pepper, black beans, vegetable broth, garlic, cumin, chili powder, salt & pepper… yup thats it!! You can eat bowls and bowls of this with no guilt at all! Now of course for some added flavor, a pop or color and some fun play with texture I added a sprinkle of cheddar, a dollop of sour cream, diced tomato, tortilla strips, fresh cilantro and a squeeze of lime. Its a winner! In a large pot over medium heat add in the olive oil, red onion and bell pepper. Cook until softened. Add in the garlic, salt, pepper, cumin and chili powder. Cook for a minute or two. Add in the black beans and broth. Bring up to a boil then lower and simmer for about 20 minutes. 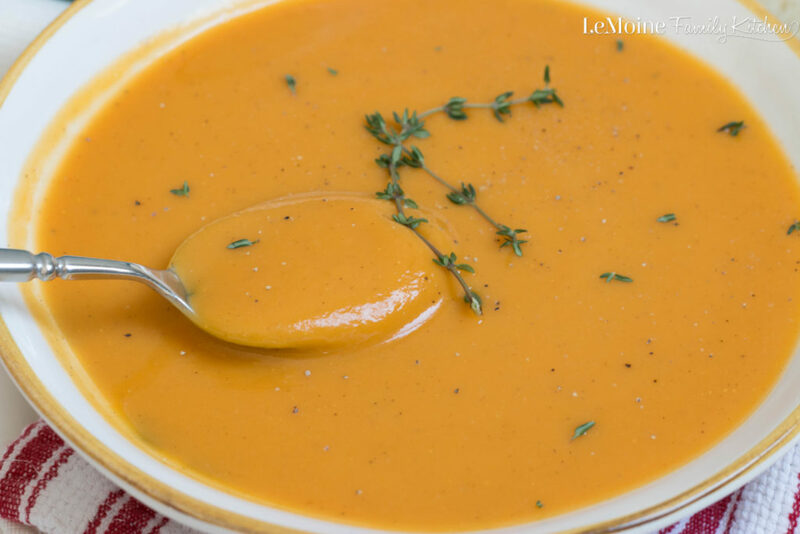 Using a hand blender, blend the soup until smooth. Simmer for another 15 minutes or so, or until the desired thickness. It is soup season for sure! This is a great one full of nutrients. Love it! 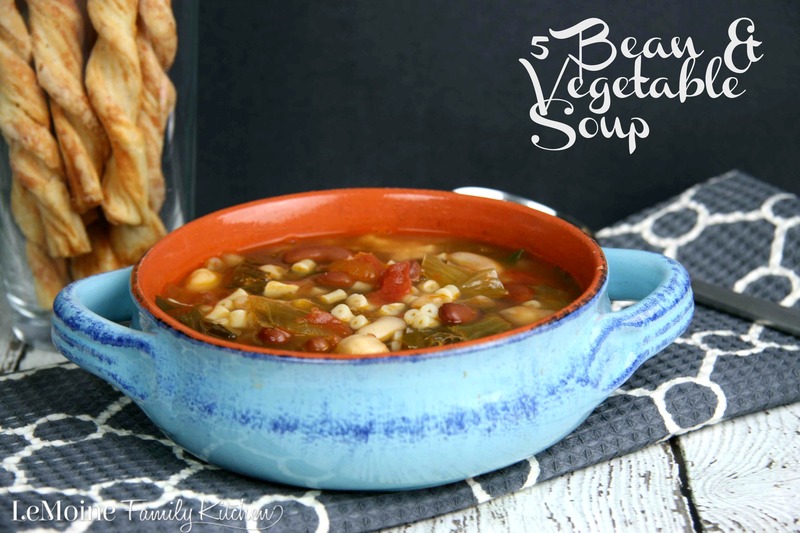 One of my favorite soups. Thank you so much, I appreciate that!